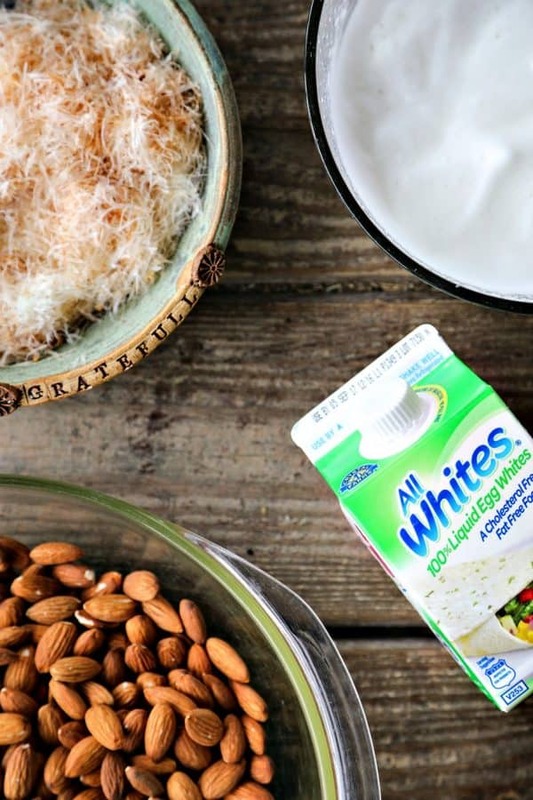 I’d like to thank AllWhites® 100% Liquid Egg Whites for partnering with me to sponsor the recipe development for Roasted Parmesan Garlic Almonds to showcase their excellent product. The recipe, opinions, and photos are -as always- my own. 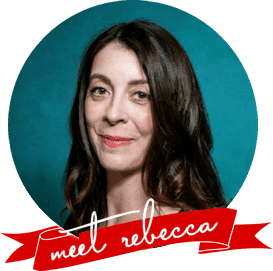 There is very little that scuttles attempts at healthy eating faster than not having a nutritious snack on hand for whenever the munchies strike and that goes for adults and kids alike. The truth is that we are a snacky family and each of us is quite likely to down half a bag of chips if there isn’t something decent to distract us. Of course, we feel worlds better when we eat snacks that pack a nutritional punch so we try to keep those on hand. 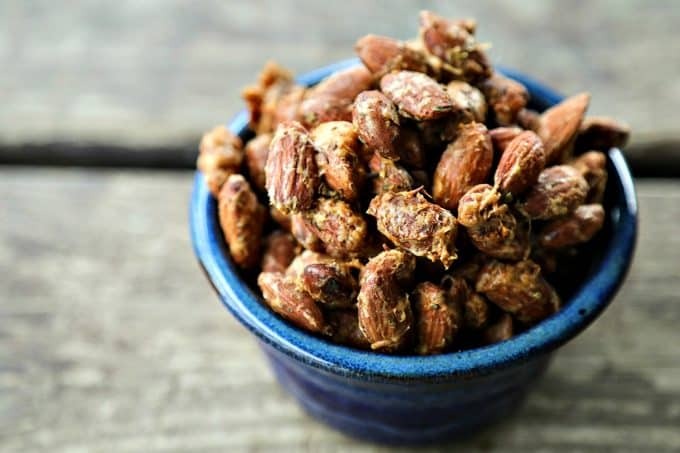 Roasted Parmesan Garlic Almonds are a simple-to-make, crave-worthy snack that takes the edge off of hunger without making you feel weighed down or like you made poor life choices. 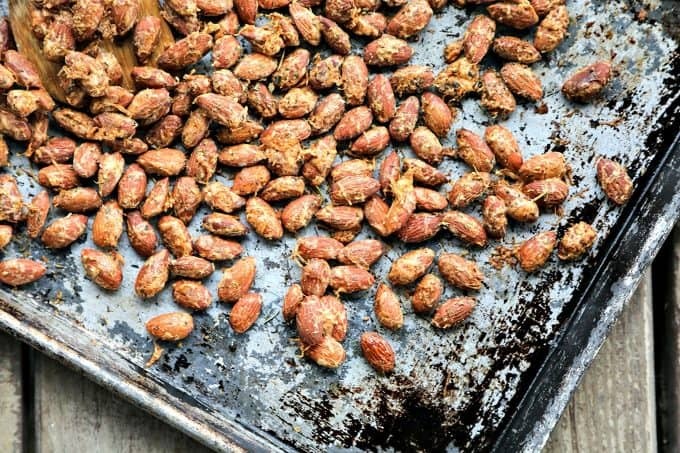 What makes these Roasted Parmesan Garlic Almonds so wonderful? They’re protein rich to give you a sense of fullness, and they have a solid dose of umami courtesy of both the Parmesan cheese, garlic, and the almonds to keep you satisfied. Some herbs and a hint of smoked paprika keep things savoury and out of the ordinary in the best possible way. When you whip up a batch of Roasted Parmesan Garlic Almonds, you can store them at room temperature and be good on snacks for a week, or until you snack them into oblivion, whichever comes first. I like to use AllWhites 100% Liquid Egg Whites for the egg white portion of this recipe because it’s so convenient and I don’t have any leftover yolks to try to incorporate into another recipe or (egads!) waste. You’ll want to grease that sheet pan to keep the egg and cheese from sticking to it. You can use either non-stick cooking spray or oil it instead. Pssst. I know the cheese in the shaker containers is convenient, but I really prefer freshly grated Parmesan here. It not only looks better on our Roasted Parmesan Garlic Almonds, but also has a better overall taste and texture. Before you start whipping the egg whites, take a moment to toss together the grated Parmesan cheese, herbs and spices, and salt. It is important to whisk or whip the egg whites to soft peaks before you use them to coat the almonds. This just means that they’ll thicken and begin to look lofty. When you lift your whisk or beaters and turn them upside down, you’ll see a peak starting to form but it will droop over on itself and then melt back into itself in a few moments. Please note there are two different temperatures at which you can roast your parmesan garlic almonds. The first is quicker; 325°F. It is done in just 30 minutes. The second is slower, clocking in at about an hour of baking time, but retains more of the nutrients of the raw almond; 250°F. Either temperature yields a delicious result. You need to stir the almonds just once during baking. After stirring them, distribute them back into a single layer and continue baking. When the baking time is up, turn off the oven and prop open the door for about 20 minutes. After that, place the baking sheet on a rack or on the cool stove top and let it come completely to room temperature before switching into an airtight storage container. 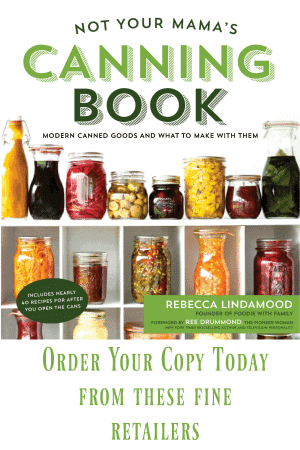 These are best stored at room temperature for up to a week. If you have a few stragglers once your week is up, you can ‘refresh’ them by reheating in a 350°F oven for a few minutes. Once cooled, they should taste crisp again. While Roasted Garlic Parmesan Almonds are an awesome snack, they also make a wonderfully nutritious and crunchy addition to salads and they’re a naturally gluten-free replacement for croutons if you need one! Satisfy your snack attack with nutrient packed, crunchy, savoury Roasted Parmesan Garlic Almonds. These also make great gluten-free croutons for salads! Preheat oven to 250°F or 325°F (see Cook's Notes). Lightly spritz a half-sheet pan with non-stick cooking spray or lightly grease it and and set aside. In a small mixing bowl, toss together the grated Parmesan cheese, Italian seasonings, granulated garlic, smoked paprika, and salt and set aside. In another mixing bowl, whisk or beat the egg whites until they reach soft peaks. Measure the almonds into a larger mixing bowl. Scrape the egg whites on top of the almonds and gently mix to coat. Toss the Parmesan mixture over the almonds and gently toss to coat evenly. 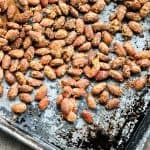 Distribute the coated almonds in an even, single layer over the prepared half-sheet pan. If baking at 250°F, bake for about an hour, stirring once every 15 minutes. If baking at 325°F, bake for about 30 minutes. After each stir, re-arrange the almonds again into an even, single layer. After an hour, or when the almonds are mostly dry to the touch, turn off the oven and prop the door open partway. Let the almonds cool in the opened oven for 20 minutes before transferring the half sheet pan to a rack to finish cooling completely to room temperature. Transfer the almonds to an airtight container and store at room temperature for up to a week. We have three little ones that all love to “help” in the kitchen. Some foods, like cookie cut-outs, they actually can assist, but a lot of the time I worry about accidentally burning them. This looks so tasty! A great dish for healthy extra calories!